We offer our gift guide to help you and your partner have a fantastic Valentines Day with our range of great gifts. Nothing states your love for another more than the sharing of a heart! Share your heart this Valentine's Day with inspirational heart-shaped gifts and love themed gifts. Jewellery and Pendants from Swarovski at Gretna Green. Lovers Bronzes and Figurines for the home. Gretna Green Lovelocks and heart decorations. Show you have thought carefully about your gift with personalisation from Gretna Green. Make it personal this Valentine's with a Personalised Gift for the love of your life. You can add personal messages in the form of engraving to a number of great products, including our ever-popular Gretna Green love locks and a choice of Dartington Crystal Champagne flutes. Gift their new favourite glass to drink their favourite tipple out of and personalise it with a message of your choice to wish them a Happy Valentine's Day. Great for sharing personal messages of love. 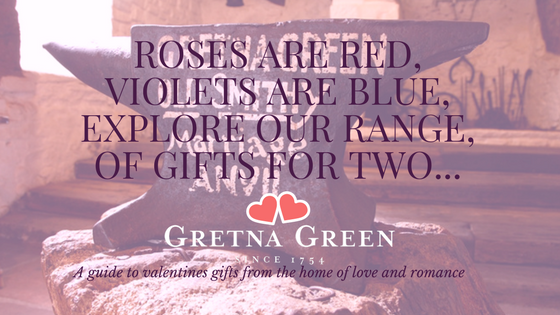 Think beyond a box of chocolate this Valentine's Day with a gift she’s sure to love from the home of Romance, Gretna Green. We stock a wide range of gifts that are great for her this valentines day. Explore a wide range of handbags, jewellery and fashion that’s sure to win her heart. Order today for shipping options all over the world from the home of romance - Gretna Green.